Place rack in the middle of the oven and preheat to 350 degrees Fahrenheit. Grease a 9”x5” nonstick loaf pan with butter. In the bowl of a standing mixer, set with the paddle attachment, beat the butter at medium speed until light and fluffy, about 3 to 4 minutes. Add the brown sugar and granulated sugar and continue beating until smooth. Add the eggs and vanilla and continue beating for a couple minutes. In a bowl, combine the flour, baking soda, baking powder and salt. Reduce the mixer speed to low, and add the flour mixture ¼ cup at a time. Continue beating until well incorporated. You will have a very dry batter. Remove a third of the batter and set aside in a separate bowl. Add the mashed bananas to the remaining batter in the mixer bowl and continue beating until the batter is fluffy and mixed. Pour the banana batter into the prepared pan. Rinse the mixer bowl and paddle attachment. Add the reserved batter and the Coronado® Dulce de Leche Caramel Cinnamon to the mixer bowl and beat at medium speed, for a minute, until blended. Reduce speed, pour in the boiling water and continue beating until completely smooth. Pour the dulce de leche caramel batter in the pan over the banana batter. Place in the oven and bake for an hour, until the top is puffed up, golden brown and a toothpick comes out moist but not wet on a corner of the bread. Remove from the oven, let cool and flip out of the pan onto a platter. Garnish with confectioners’ sugar. Once it has cooled completely, cover it, so it retains and even gains more moisture. How important is it to use “unsalted“ butter? I only have salted . I recommend you use unsalted butter whenever you are baking… can you look for some next time you are at the market? Would I have to adjust the cooking time if I were to make this in a bundt cake pan instead of a loaf pan? It will probably need a few minutes less, Rahul. You check for the doneness by using a toothpick. 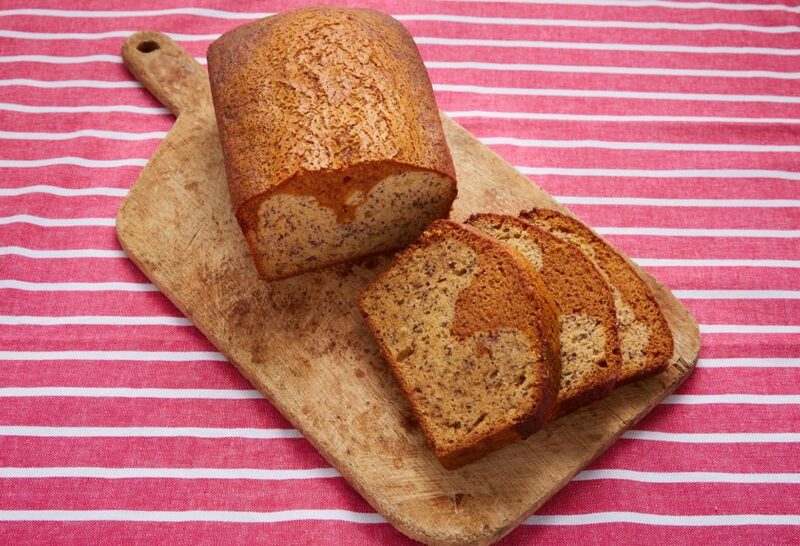 Hey patti love this recipe I’ve made many different banana bread recipes and this one is awesome thanks patti. Wish I could add a picture for you!!! I wish I could see a picture, William! Hi Pati……can I use coronado regular cajeta and then just add some cinnamon? La Lechera has dulce de leche….which do u suggest? Exactly! You can add cinnamon to the cajeta that you have, Emi. You can usually find it in the Latin/International aisle at your local retailer. Or if you can’t find it, Yolanda, you can add cinnamon directly to the batter. Enjoy! My family loves my banana bread but this Wil be an upgrade can’t wait to try it ! Awesome! Enjoy the banana bread, Grace. Hola Pati! Es posible a hacerlo sin mixer? Sí! Lo puedes hacer con ​tus manos o una batidora de mano. I recommend Dulce de Leche…you can use any brand you find online or in stores…and then you can add cinnamon to taste. Enjoy the Banana Bread, Ann! Do you have to use the goat milk dolce de Leche? I make my own with sweeten condensed milk, would that work? This recipe was a such a hit with my family! It was delicious! Thank you Pati! So happy to hear it was a hit, Suzie. Thank YOU. You can try to find Cajeta, which many times is also called Dulce de Leche in the Hispanic/International food aisle of your market, or you can find it online. Enjoy the banana bread, Darryl! I just baked this bread and it is DIVINE ! Delicioso pan gracias x compartir tus recetas. Saludos un abrazo !!!! Mis niños cuando vieron el video del pan de banana me dijeron wow que rico se ve así que lo voy a hacer me encantan las bananas, gracias x compartir tus recetas deliciosas!! Saludos un abrazo!!!! Uy mil gracias, Mayra! Dile hola a tus niños de mi parte. Pati, can I use another brand of dulce de leche and add ground cinnamon, ( 1 teaspoon? ), to the batter? This sounds amazing! I have looked everywhere and cannot find “Coronado dulce de leche”. Only Coronado brand made with goats milk. Is that the same thing? Would love to try this recipe! You can usually find it in the Hispanic aisle of major retailers, Doreen. If you can’t find it, you can add cinnamon to the dulce de leche caramel (that’s made with goat’s milk) that you can find. Have fun making it! Gracias, Pati, pero, no. Tengo Diabetes typo II, me parece delicioso. Sabroso probably translates to Savory, savored, or some other derivative. Or just plain DEEEEELICIOUS? Thanks for the tip on sabroso, Linda. My grandson liked this so much that he licked his plate. My husband concurred. Thank you so much. I had Coronado cajeta in the house so I used that. Hahaha…so sweet. Say hola to your grandson and husband for me Linda. This looks great. Can you exclude the banana or substitute it? Oh you can find out more about it here: https://barcel-usa.com/coronado I hope you love the banana bread, Bobbi! Could you just add some cinnamon to this batter? Bobbi, you can find it on Amazon but it’s called Coronado Cajeta Quemada. Took me a while to find it but I did so I’m sharing the info. Hope that helps.